Starting with a Monogram Blue Beetle 1929 Ford Model A pickup kit, Norman set out to build the perfect summer vehicle as the roadster pickup kit came with a surfboard, scuba gear, and a beach scene on the box art. 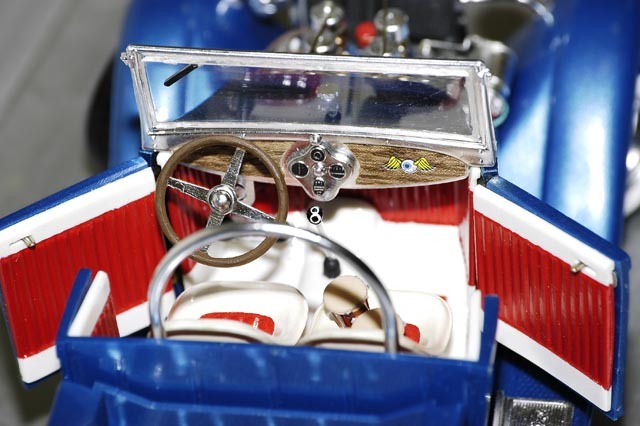 Norman made two significant changes to the kit: he opened the doors (the source of his troubles) and made the steering poseable. For the steering, he made a tie rod from a plated aluminum tube and cut spindle arms from sheet aluminum. Then he finished the job by drilling and pinning the joints. Norman painted the body in Pactra Diamond Flake Star Blue, applied wood grain contact paper to the bed floor and dash board, and added strips of chrome graphic tape for the rub strips in the bed.